Every morning, after I’ve been for my walk, I sit with a cup of tea and read my meditation for that day from a book I bought over 20 years ago – 365 Daily Meditations by Deng Ming-Dao . The one I read today seems very apt for those of us who love the process of writing, so I’d like to share it with you. Into paper-and-ink stories of wonder. One author said, “I can get rid of anything by writing about it,” meaning that the process of exernalizaton could liberate the pain in his soul. That realization produced a delicious dichotomy: to free himself, or to hold on to both joys and tortures by remaining silent about them. Writers write because they must: They need to express something from deep within themselves. They hear voices that others do not. They listen urgently, and they must communicate what they hear. Many thanks to those of you who attended my workshop ‘Using Theme To Brainstorm Your Story’ at this year’s When Words Collide Conference in Calgary. Several people asked for a copy of my Powerpoint presentation. I am unable to provide that, but here are the main points of my workshop. THEME is what your story is ‘ABOUT’. It’s the emotional heart of your story. It’s the human emotion of your story which creates an emotional resonance within your reader. The theme of your story can be told in one word. Why does your script need a theme? Because you’ve created this killer premise, but unless there is some emotional logic for the audience (reader) to connect to that premise, the audience (reader) will leave the theatre – (or close your book) – apathetic to what they have just seen or read. Authors sometimes state their theme in their choice of a single word book title. Ian McEwan’s Atonement. Jane Austen’s Persuasion. I hate sports films with a passion – especially boxing ones – but I love Rocky and will watch it over and over again. Perhaps it’s because the underlying emotion of respect permeates every single scene in the movie, whether through dialogue, setting or action. Take one of the first scenes in the film – Rocky goes to his locker to find his key no longer works. His belongings have been relegated to the hooks on the wall, commonly known as Skid Row. What a display of lack of respect for Rocky, that is. Imagine how he feels? His self-respect must be shattered. Apollo Creed also fails to show Rocky respect in a way that will come back to bite him. He thinks little of Rocky’s boxing skills – even waving off one of his trainer’s concerns when his trainer sees Rocky’s preparation for the match – therefore does not train for the fight. By the end of the match, Creed’s attitude has changed. ‘Ain’t gonna be no rematch’. Very often you will find that the same recurring theme crops up in your stories because it will be something that is important in your life or your value system. Back in 1975, Sylvester Stallone was an aspiring actor with dreams of making it big. But he had a lot going against him including a slight paralysis of his mouth which left him mumbling. Inspired by a boxing match between Mohammed Ali and Chuck Wemper, Stallone wrote the script of Rocky in 3 days. Producers were interested in the script – but not in him. Stallone refused to sell the script unless he played the title character. The film went on to be nominated for 10 Academy Award. It won two, including Best Film. So how can you use theme as a brainstorming tool? Easy. Grab a piece of paper and draw a cross in the middle. At the top, write PHYSICAL, and the bottom, EMOTIONAL. 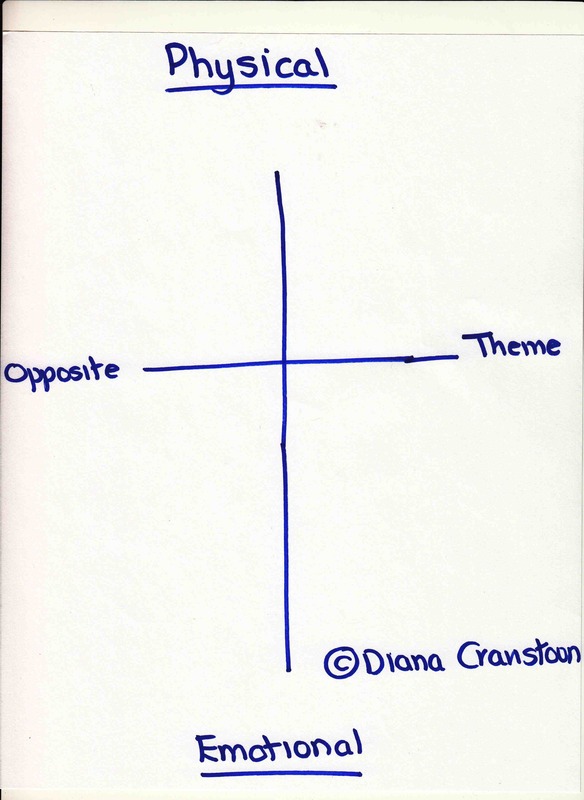 On the right hand side of the page, write your THEME, and on the left hand side, write the OPPOSITE of your theme. James Cameron said that Titanic was about MAKING EVERY DAY COUNT. I hate to argue with such a successful director, but I’m not sure you can can make every day count unless you have the FREEDOM to do so. So for me, I would say the theme of Titanic is freedom, and it is illustrated by depicting FREEDOM and it’s opposite (ENSLAVEMENT) in dialogue, setting, action scenes etc. So how can you use the above diagram to brainstorm your story? 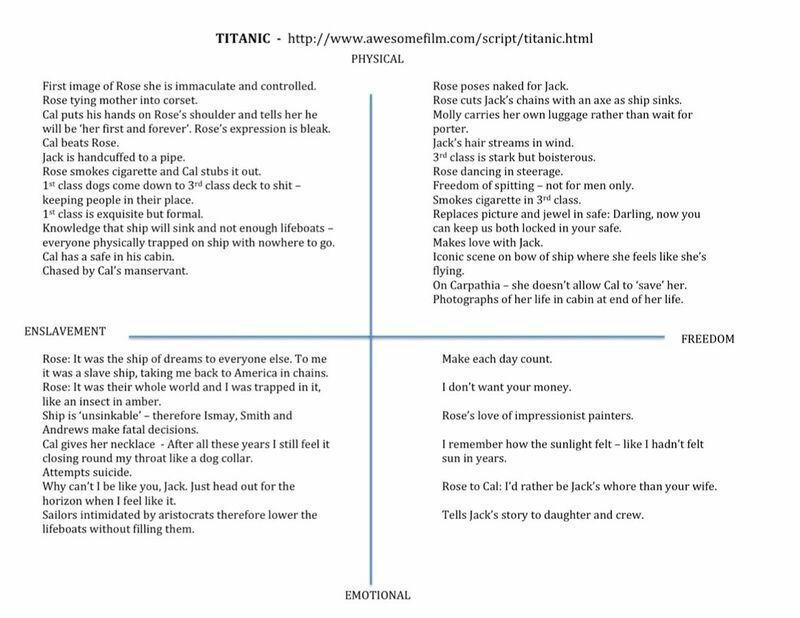 In the case of Titanic, take a piece of paper, as above, and write PHYSICAL at the top and EMOTIONAL at the bottom. On the RHS of the page write (what I believe is) the theme – FREEDOM. On the LHS of the page, write ENSLAVEMENT. Then you can brainstorm ideas which you think represent Freedom and Enslavement in physical and emotional forms. Rose poses naked for Jack. Rose cuts Jack’s chains with an axe as the ship sinks. 3rd class is stark but full of life and energy. Rose spits into the wind. Rose smokes a cigarette in 3rd class. Rose makes love with Jack. Iconic scene of Jack and Rose on prow of ship. On the Carpathia rescue ship – Rose refuses to allow Cal to save her and return her to her old life. Rose attempts suicide – preferring the release of death to living the life proscribed for her. Rose’s love of impressionist painters who paint what they feel rather than exact depictions of their subject. Rose finally has the freedom to tell her story to her granddaughter and the ship’s crew. Rose ties her mother into a corset. Cal puts his hand on Rose’s shoulder and tells her he will be her ‘first and forever’. Rose’s expression is bleak. Cal beats Rose. She cannot fight back and the maid’s subservient position prevents her from intervening to rescue Rose. Jack is handcuffed to the ship’s piping. 1st class dogs are taken down to the 3rd class deck to piss and poop – a clear visual of the rigid class structure and people’s roles within the class structure. People cannot move freely from one deck to another – they are held back behind metal doors. 1st class is exquisite, but there are rules to be followed. Cal has a safe in his cabin. Rose places Jack’s photo and the jewel in Cal’s safe and writes, Darling, now you can keep us both locked in your safe. Rose: ‘It was the ship of dreams to everyone else. To me it was a slave ship, taking me back to America in chains. Rose: ‘It was their whole world and I was trapped in it, like an insect in amber. Everyone believed the ship was ‘unsinkable’ therefore Ismay, Smith and Andrews made fatal decisions. Had they not been ‘trapped’ in their thinking, the ship might have been saved. The sailors manning the lifeboats are so trapped in the British class system, that they allow themselves to be intimidated by the rich into lowering the lifeboats without filling them, even though there are not enough lifeboats for everyone aboard. These are only a few examples, but hopefully it gives you an idea how using theme can help you brainstorm your own story. IT’S A BRAW, BRICHT, MOONLICHT NICHT, THE NICHT. Writing accents in a novel is tricky. Too much can turn readers off by pulling them out of the story as they try and work out what you’re trying to say. Too little can have a diluting effect as your story could be set anywhere. 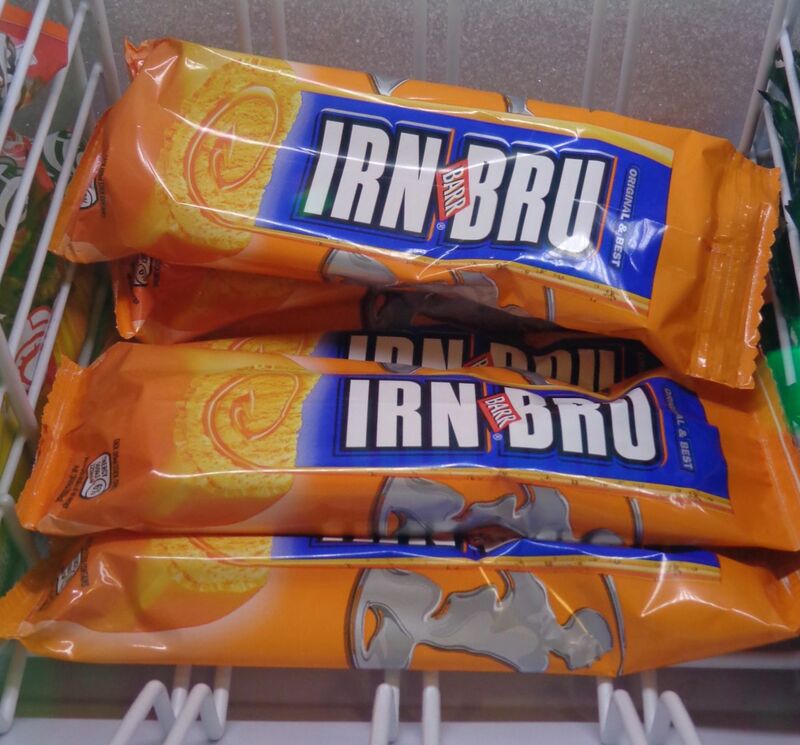 As a Scot who’s lived in Canada for many – many – years, here are some common contemporary phrases I notice when I go back to Scotland on holiday. If you’re writing a modern day novel set in Scotland, you might find some of them useful to add a little colour to your setting. Wee – Scots use this a lot. Wee monster. Wait a wee minute. Wee boy. It’s a wee way up the road. Wean – (sound like wane) A small child. Outwith – eg Outwith my control. – Outside (out of) my control. On your tod – On your own. Scooshie cream – Canned whipping cream. Chum you – Accompany you. eg How about I chum you along the road? Go down the town – Go downtown. Alcohol is sold in all supermarkets and village stores. The only time it’s not available is on a Sunday morning until 12.30pm – when you should be in church. Children are usually allowed in lounge bars and pubs – with their parents – until 8pm. Midgies (Scottish mosquitoes) arrive in May and go right through the summer until August. They are a tiny, but major, irritation and can spoil a holiday if you’re not prepared. To avoid them, stick to the beach, make the most of a windy day, or make sure you’re wearing repellant. The longest running police drama in the UK was ‘Taggart’, set in Glasgow. Glasgow Kiss/Glasgow Coma Scale. One leads to the other. A Glasgow Kiss is a vicious headbutt. The Glasgow Coma Scale is the scale used in hospitals worldwide to assess consciousness (or lack of it!) following a head injury. There’s a (friendly!) rivalry between Scotland’s two major cities, Edinburgh and Glasgow. Depending on where you’re from, you might say that the best thing about Glasgow is the road to Edinburgh, or… You can have more fun at a Glasgow funeral than you can at an Edinburgh wedding. Back in the 18th/19th centuries, Glasgow was a major centre for the international slave/sugar/tobacco trade and was known as the ‘Second City’ of The Empire. The three major Scottish Banks (Royal Bank of Scotland, Bank of Scotland and Clydesdale Bank) all issue their own banknotes. The Screen Machine is a truck that brings a mobile cinema to the Scottish Isles and remote Highlands so locals can catch up on the latest films. 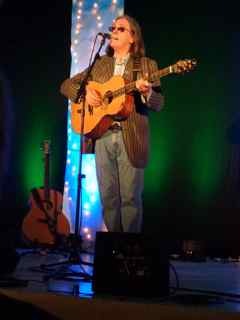 I’m still thinking about Dougie Maclean’s concert last week and playing his music on my iPod as I’m writing this. All his songs are very beautiful and powerful but, when people go to one of his concerts, there is one song, above all, they want to hear. 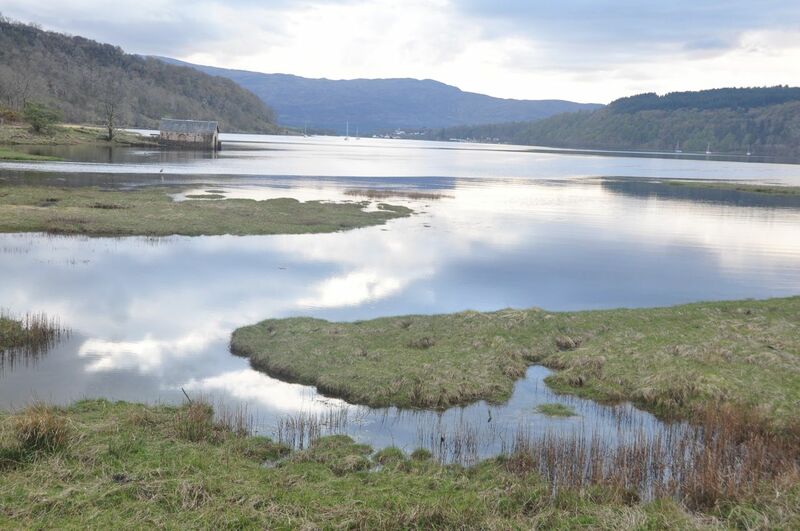 Caledonia was the name the Romans gave to Scotland, the country beyond the wall that they were unable to conquer. (Sound familiar, Game of Throne-ers?) Somewhere around Perth (not Hadrian’s Wall) is where The Roman Empire ended. Caledonia, the song, has become popular world-wide. The Americans love it, the Irish claim it as their own. It’s played at weddings, funerals, football matches, military tattoos, rugby games, adverts and is often called Scotland’s unofficial national anthem. Dougie Maclean calls Caledonia his loveable monster because it’s taken on a life of its own. He wrote it a long – long – time ago on a beach in France when he was feeling very homesick. It’s a song of longing – and belonging – written from the heart. And therein – I believe – lies its magic. As writers we’re told to write about the specific, not the general. By writing about the specific – in the case of Caledonia, Maclean’s homesickness – he touched on one of the unique experiences and emotions every single person in the world feels, understands and relates to. You don’t need to be Scottish to understand the love you have for your homeland – whatever that country may be – or your need to be with your ‘ain’ folk. You just need to be human. There are all different versions on Caledonia available on Youtube, but even though I’ve already posted this one several times it remains my favourite. Enjoy. I’m on my holidays and finding it hard to stick to my routine of Mon/Wed/Friday posts on History/Travel/Writing. Which is a good thing really, because holidays are a time for stepping back and taking time to look at yourself in the world. 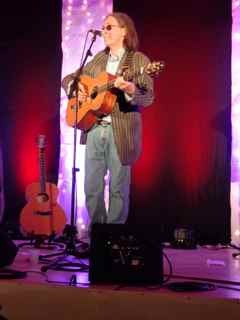 One of my best experiences this trip has been the opportunity to hear Dougie Maclean perform in a tiny village hall in the back-of-beyond Perthshire. For those of you who don’t know of him or his music, if you’ve ever watched the film The Last of the Mohicans and listened to that wonderfully hypnotic music – that’s his. Or how about ‘Caledonia‘, a song that people around the world have taken to their hearts – his ‘loveable monster’ as he calls it – and which one day may become Scotland’s national anthem. One of the songs he performed the other night was The Scythe Song, a haunting and incredibly wise song about learning, practise and patience. He told us the story behind it; of how his father, a farmer, was skilled at scything the old-fashioned way, slicing through the wheat which then fell to the ground with a softly whispered hishh. Dougie tried to copy him but was unable to match his father’s skill. Then, by changing one single word and adding another, he completes the circle and teaches all of us that, no matter what our passion, whether it’s writing, singing, knitting, sports, building, engineering, science, the answer is the same.